Steve and Luci are known to most area farmers and the greater Missoula community as the original organic farmers in this part of western Montana. They have been raising a wide variety of organic, biodynamic produce for over 20 years in Victor and are affiliated with Lifeline Dairy and Creamery. Every season they work with interns who live with them, share meals and learn how to farm organically and make a living doing it (for info about the apprentice program, click here ). Lifeline Produce has many secured markets in Victor, Hamilton and Missoula, as they have been farming here for some time. These include wholesale markets at grocery stores – the Good Food Store, Orange Street Food Farm, and two Super One Supermarkets – and the original Missoula farmers market. In 2006 they grew more produce to sell through the Growers’ Cooperative. Steve and Luci were happy to add another market outlet through WMGC to refine their family farm in and work with more local farmers. 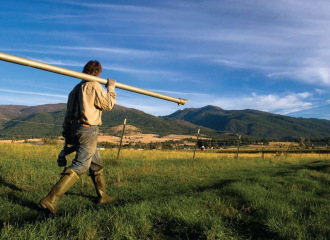 In 2005, Steve and Luci helped found the Montana Sustainable Grower’s Union to underscore the importance of eating locally grown food, and to systematize farmer collaboration, cooperation and coordination. Members of the MSGU agree to utilize organic growing practices and market only to local customers. The union even developed its own label – Homegrown – as an alternative to the USDA certified organic label. To learn more, please see the web site www.homegrownmontana.org.